The Options Income Engine trading method is based on over 40 years of research, testing, and trading in the markets. We help you protect your portfolio with strong risk management rules that help ensure your losses are as small as possible. We show you how to enjoy the short-term trends that appear again & again, where the average trade duration is 1 to 3 weeks. Take advantage of trading opportunities in multiple exchanges, including the NASDAQ & NYSE. We've Done All The "Heavy Lifting". You Just Need 10 Minutes Or Less Each Night To Trade The Highest-Potential Markets. The Options Income Engine Trade Alert Software analyzes the markets after they close and applies 4 separate trading methods to find the highest-probability and lowest-risk options for your consideration. And because it’s web-based, besides your computer, it will run on any modern digital device with web access like your smartphone or tablet. As an Options Income Engine student, you get premium live chat and email support with our full-time staff of professional traders. Have a question with a particular trade? Let us know. No question is too simple or too complicated. We’re committed to helping you reach your trading goals. Everybody knows one of the fastest ways to achieve your goals is to work with a coach. That’s why we give you 8 bonus group coaching sessions when you enroll as an Options Income Engine student. You’ll meet once a week with our senior traders. They’ll pull up their charting software and discuss current market conditions and answer your questions live in a group setting. These sessions are also a great opportunity to learn from others’ questions. Buy & Hold Investing Is DEAD! According to The Wall Street Journal, Forbes, CNBC, Market Watch, Kiplinger, CNN Money, The Street, and others, "buy & hold" investing is DEAD. But that's OK because Options Income Engine is a solution you can use for years to come. Your investment is 100% guaranteed. If you’re not happy with Options Income Engine for any reason, just contact us at 248-344-4440 or send us an email to support@profitsrun.com before your 60-day trial ends and you'll receive a prompt and courteous refund. No hard feelings, and we'll part as friends. Don't Say 'Yes', Just Say 'Maybe' And Start Your 60-Day Trial Today. Prove To Yourself It Can Work And Then Decide If You Want To Keep It. 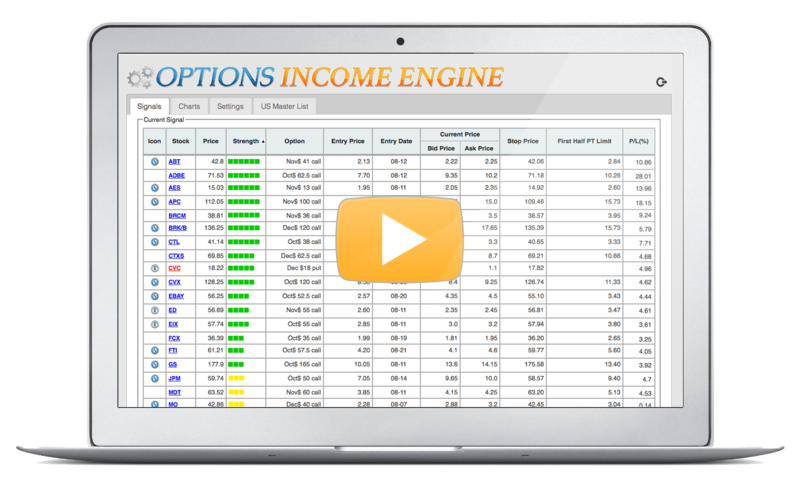 Yes, absolutely, because Options Income Engine is standalone software with its own data feed. That means it doesn’t matter who you use for a broker. Options Income Engine alerts you when it’s time to trade. Then you simply place and manage your trades with your broker’s software. It’s that easy. It will work anywhere in the world that has an internet connection. So as long as you have a computer, smartphone or tablet with web access, you can use Options Income Engine from anywhere in the world. It depends. The Options Income Engine trading methods are based on over 40 years of real-life experience in the markets which consisted of thousands of hours of trial and error, research and testing, and thousands of dollars in lost trades before finally figuring things out. So it depends on how much time you have and what you think your time is worth. But like most things in life, it’s almost always cheaper in the long run to just invest upfront, take the short-cut and “get it right”. We have a 60-day 100% money back guarantee. If you don’t like Options Income Engine for any reason, just contact us at 248-344-4440 or send us an email to support@profitsrun.com before your 60-day trial ends and you’ll receive a prompt and courteous refund. No hard feelings, and we’ll part as friends. All you need is 10 minutes or less each night after the markets close. Options Income Engine will automatically analyze the latest market data and alert you if you need to take action. That way you don’t need to stay glued to your computer. No. Trading robots are usually cheap, gimmicky plugins that claim to make you rich while automatically trading while you sleep. In contrast to that, Options Income Engine is more like having a personal trading assistant that taps you on the shoulder when it’s time to consider a trade. The actual trading remains safe in your hands so you always know what to do. Add Short-Term Options Trading To Your Trader's Toolkit & See The Results Firsthand. What we don’t do is promise to help you "get rich quick" – that’s why you won’t see any crazy income claims from us. Instead, our philosophy is more along the lines of protecting your portfolio as much as possible. And that’s why our primary focus with all of our programs is risk management. Once you learn how to properly manage risk, most of the stress usually associated with trading can disappear. That gives you the freedom to go after as much profit potential as possible in the safest markets. Email the Profits Run Support Staff at support@profitsrun.com. Call the Profits Run Support Staff (Monday – Friday 9am – 5:00pm Eastern) at 888-303-4440 or 248-344-4440.